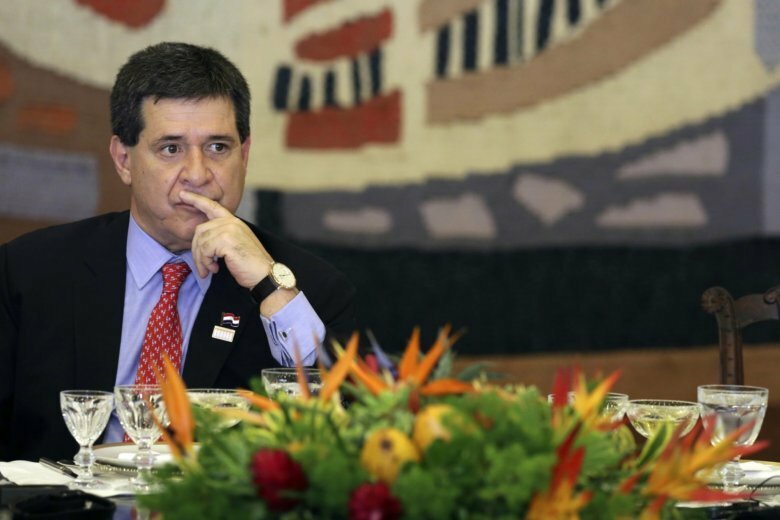 ASUNCION, Paraguay (AP) — Paraguayan authorizes have issued an arrest warrant for a man President Horacio Cartes has described as his “soul brother” as part of a sweeping investigation into corruption in Latin America. A financial crimes prosecutor on Wednesday accused the president’s friend, Dario Messer, of money laundering and criminal association. The dual Brazilian-Paraguayan citizen has been on the run since Friday, when Brazilian authorities issued an arrest warrant there. Brazilian authorities alleged Messer is the leader of a group of Brazilian illicit money dealers who delivered bribes as part of the mammoth “Car Wash” kickback scheme, the biggest corruption scandal in the history of Brazil. The Paraguayan prosecutor also accused one of Messer’s sons and three other men. Cartes’ five-year term ends in August. Paraguay’s constitution says former presidents are automatically “senators for life,” with a “voice but without a vote.” Cartes, however, won a Senate seat during last month’s elections, which would give him a voting role, and the courts sided with him. On Wednesday, Congress voted to name former Supreme Court Justice Alicia Pucheta as the new vice president. She is a Cartes ally, and some analysts say the move opens the way for Cartes to resign so he can take a voting seat in the Senate, which would extend his political influence into the future.